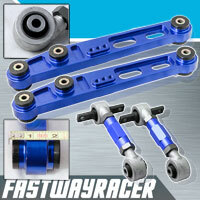 Brand new adjustable front upper control camber arm+bushing kit. 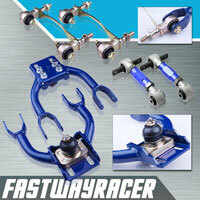 The upper control arm is made of high quality forged alloy steel. We offer 6 months warranty. It is direct bolt on without any modification. Tubular design for more stronger. Hard rubber bushing for a more direct feel and driving experience. Light weight, durable performance. When you lowering your vehicle, these eliminates premature tire wear while improving handling and stability. This front upper control camber arm can be adjustable to find tune your vehicle handling in the front without removing from the vehicle. It is easy to access turnbuckle style adjustment. Brand new 2 pieces complete Version 2 rear camber kit. 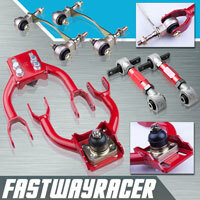 It is made of forged alloy steel and aircraft quality 7075 aluminum. We offer 3 years warranty! 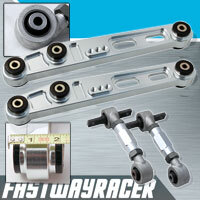 This is our new Version 2 rear camber kit. We made a significant improvement than other generic camber kit. 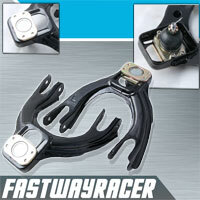 It is direct bolt on and designed for street&race-precision adjustments. These rear camber adjusters are equipped with hemispherical rod-ends that allow incredibly controlled rear suspension travel and predictable reponse, and significantly improve handling and allow for even tire wear.